Logo Sports supply our uniform to parents. 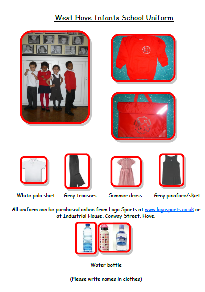 Uniform is available to purchase, either online, by filling in an order form or by visiting the local shop situated at Industrial House, Conway St, Hove BN3 3LW. There is ample parking and the shop is open longer hours than the school office – 9.00am – 5.00pm Monday to Friday and 9.00am – 1.00pm on Saturdays. Visit Logo Sports website. All items of uniform need to be labelled with your child’s name and class.